Thanks to bills California governor Jerry Brown signed in July, Californians now face ID and background checks to purchase ammunition, and the state will create a new database of ammunition owners. 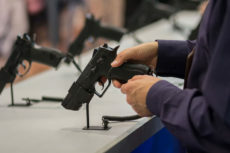 Magazines holding more than 10 rounds are banned and the state now restricts the loaning of guns, without background checks, even to close family members. Californians can be forgiven for thinking that these measures burden law-abiding citizens more than they restrict the violent criminals who flout the law. The six gun-control bills that Gov. Brown signed, however, are not the limit of California’s surge in gun control. As Diana Lambert explains in the Sacramento Bee, the UC Davis Medical Center “will house the nation’s first state-funded firearm violence research center.” The University of California Firearm Violence Research Center gets a five-year grant of $5 million, part of the governor’s budget package. Garen Wintemute, a physician and expert on “firearm violence,” will head the center, whose first project will be “a survey that looks at who owns guns, why they own them and how they use firearms.” Californians could be forgiven for thinking that, as Sam Paredes of Gun Owners of California told Lambert, the state research team seeks “any justification to control guns” and has never shown firearm ownership in a positive light. Wintemute claimed to be “driven by data, not by a policy agenda,” and that suggests a project for his new state-funded center. In Gun Control in the Third Reich: Disarming the Jews and “Enemies of the State” author Stephen P. Halbrook compiled data on the way Adolph Hitler’s Germany restricted firearms. The Nazis also wanted to know “who owns guns” and they ruthlessly suppressed firearm ownership by disfavored groups. Do California’s new gun laws, with their heavy-handed restrictions and database of ammunition owners, resemble in any way the gun laws of National Socialist Germany? After all, Nazi Germany was one of the most repressive and violent regimes in history. For $5 million, California taxpayers surely deserve an answer.